Here you will find current system information, and where we have been in our D-STAR Odyssey. Read, Enjoy and Join In! We have moved the 23cm DV repeater to 1286.100- in response to the rollout of new radar equipment at local airports. 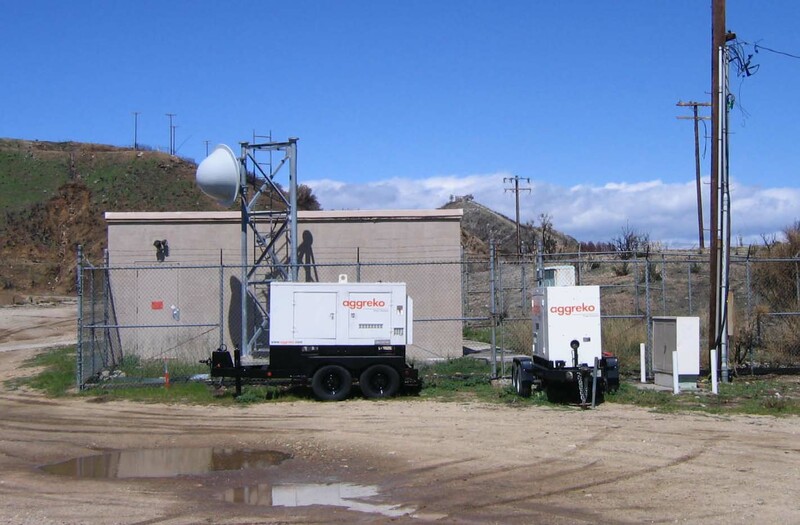 The ARRL reports, "The Federal Aviation Administration (FAA) is deploying a new generation of Common Air Route Surveillance Radar (CARSR) that has some implications for the use of the 1240-1300 MHz (23 cm) band by amateurs. The Amateur Service allocation in this band is on a secondary basis, with aeronautical radionavigation and several other services primary in the United States Table of Frequency Allocations. The FCC rules require that amateur stations operating in the 23 cm band may not cause harmful interference to stations in the radionavigation-satellite service, the aeronautical radionavigation service, the Earth exploration-satellite service (active) or the space research service (active). One case of harmful interference in Southern California has been reported. CARSRs are being installed in several dozen locations throughout the country and will use various frequencies in the 1240-1350 MHz range with an occupied bandwidth of about 3 MHz. In the vicinity of the radars, amateur operation may be precluded in a portion of the 23 cm band. The ARRL is in contact with FAA engineers. We anticipate that the constraints on amateur use of the band will be limited to those necessary to protect aviation safety, which of course cannot be compromised." So if you have an ID-1, check where your favorite repeaters have moved to and reprogram accordingly. Looking back on 2010 it has been a good year for D-STAR. What ICOM started, many have picked up and run with in 2010. Gateway software enhancements have made linking easier, more robust, and integrated GPS position reports. There are now 36 reflectors worldwide offering lots of linking possibilities. We now have a multitude of non-ICOM repeater systems on the network in the UK, Europe, Australia and here in the States as well. Look for even more non-ICOM D-STAR radio development out of Europe and the UK in 2011. And if there is not D-STAR repeater nearby? No longer a challenge with the 2010 advent of the DVAP, which has brought D-STAR to any place you have an internet connection. Even if there is a repeater nearby, the DVAP is a handy addition to your radio livery... I know it has breathed new life into my 91AD. For the IRC it has been a pretty good D-STAR year as well... August marked four years of IRC D-STAR from Contractors Point, no fires threatening the site or frequency changes this year, and Leon remembered the keys for our Holiday party ;-) From all of us in the IRC we wish you a happy holiday season and a prosperous 2011! On December 5 our 2 meter D-STAR repeaters QSYed to their new pairs! WA6IRC C is now on 147.560, and WB6IRC C is on 147.540, both with a -2.555 MHz offset. The D-STAR community and TASMA have worked together over the past several months to find a home for D-STAR that benefits all users of the 2 meter band. Our thanks to the folks at TASMA for their open and positive approach towards making coordination work for the whole 2 meter community! For programming info see our programming page. 2 meter D-STAR from Contractor's Point, WA6IRC C and Blueridge, WB6IRC C is back on the air! The D-STAR community has been working with TASMA to find a new home for D-STAR that works for the 2 meter community here in Southern California. At the recent TASMA meeting, the D-STAR community submitted a proposal for new repeater pairs that addresses the concerns raised by the recent FCC ruling. The proposal was passed; however concern was raised regarding accommodating long standing simplex use in the proposed D-STAR subband. Instead of implementing the proposal 'as-is', TASMA decided to delay implementation until December, while the Technical Committee looked at accommodating long standing simplex use by channelizing the new simplex spectrum. The Committe decided this channelization would work for simplex users, therefore the new D-STAR and simplex band plans will become effective December 5, 2009. Rather than have 2 meter D-STAR down until the TASMA meeting on December 5, and recognizing we have been off the air for some time now, TASMA suggested the D-STAR community make use of the auxiliary frequencies as an interim solution. Bottom line is we will be back on 145.605 and 145.585 MHz for the time being, with the move to the new frequencies occuring on December 5. Something else to celebrate is the fact that we are back on the grid at Contractor's! 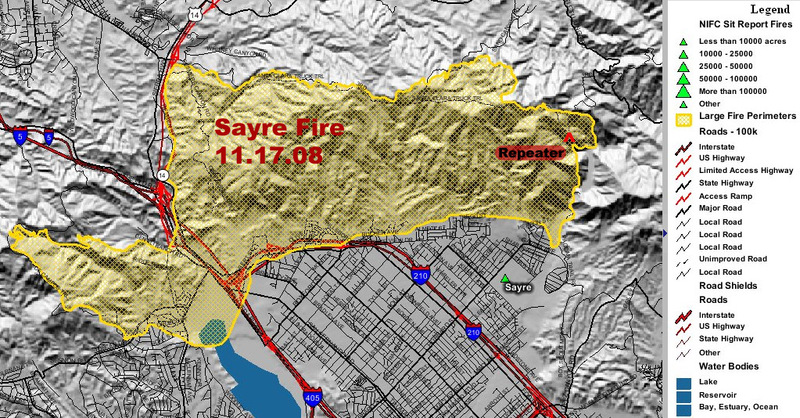 We have been on gereator power since the Sayre Fire in November 2008. Aftetr many months of discussion, Edison and the Forest Service agreed on a design for rebuilding the pole line, and underground construction has been completed. Whew! 2 meter D-STAR from Contractor's Point, WA6IRC C and Blueridge, WB6IRC C are off the air while we work with TASMA to find a new home for D-STAR that works for the 2 meter community here in southern California. And, yes, we are still on generators at Contractor's point. Edison and the Forest service have agreed on a design for rebuilding the pole line, so we anticipate being back on the grid "soon". 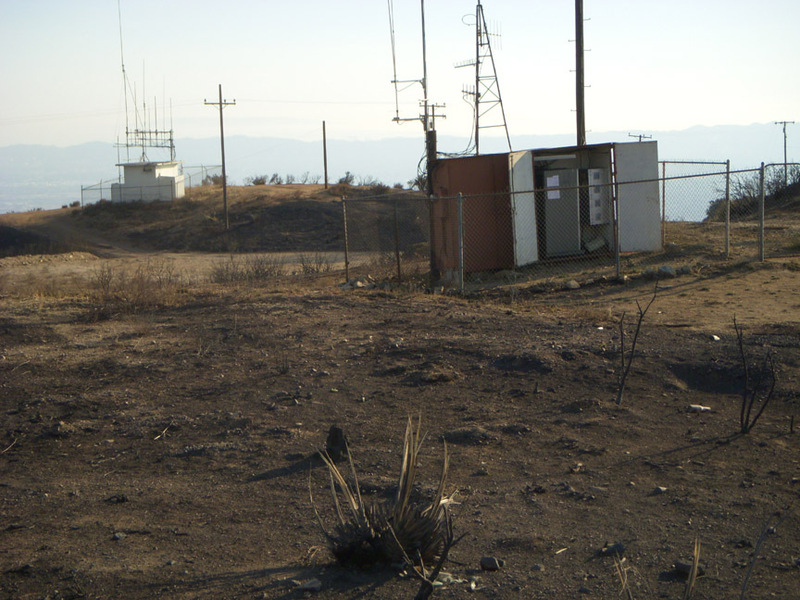 On March 23, 2009, the FCC released a ruling on repeaters that impacts 2 meter D-STAR operations here in Southern California. In December of 2007, the President of the Northern California Packet Association, Gary Mitchell,WB6YRU, filed a petition with the FCC requesting clarification of the definition of a repeater. The Commission took a look at Part 97, specifically 97.3(a)(39) which defines a 'repeater' as "An amateur station that simultaneously retransmits the transmission of another amateur station on a different channel or channels." Do you remember your grammar school English? The Commission does, and in their ruling they stated, "Because the word 'simultaneously' in the definition is used to modify 'retransmit', we believe it refers to a repeater station's transmitter being active when retransmitting the signal received by the repeater station's receiver from another amateur station. We conclude, therefore, that 'simultaneously' as used in the definition of a repeater refers to the receiver and transmitter both being active at the same time." Bottom line: D-STAR repeaters really are repeaters in the Commission's eyes. So how does that impact us? TASMA, the 2 meter coordinating body here in Southern California, has set aside 4 frequency pairs for D-STAR between 145.585 and 145.615 MHz, but 97.205(b) states a repeater may not receive and retransmit between 145.5-146.0 MHz. Since the local D-STAR subband falls within these limits, we can not legally operate our 2 meter D-STAR repeaters. In order to remain compliant with the rules, we have turned off the Contractor's Point and Blueridge 2 meter D-STAR repeaters. We have also contacted TASMA to request some new pairs. We anticipate TASMA will move quickly, so check back regularly for the latest. It is near the end of March now, and we are still on generator power at the site. After taking a closer look at the generator output, we saw that it was fluctuating between 70 and 83 volts, with some 103v peaks. 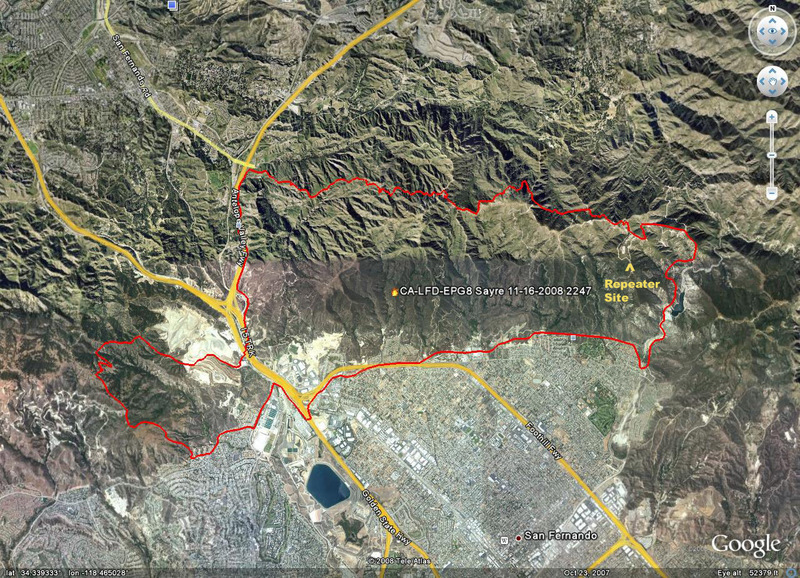 Long story short, after several calls, SCE has the generators running at a pretty steady 120v. They anticipate that the Forest Service will allow completion of repair work very soon now. It is near the end of January and we are still on generator power at the site. SCE has replaced lines but is not permitted to energize the circuit until removal of the remnants of the old power poles is complete. The gateway equipment really doesn't like the power fluctuations, especially the data link radio. We have experienced several dips/surges/anomalies that have required a trip to the site and Leon's "gentle touch" in order to bring things on-line. We are evaluating the data link radio after the latest power anomaly as it does not appear to have come out of the event unscathed. 11.30.08: Starting Saturday, 11.29.08, SCE is providing AC power at Contractors Point using portable generators until normal AC power is restored. As a result all of our systems are back on the air. The 220 machine and the D-STAR system are all functioning including the internet gateway. Leon KC6JAR and Ken W6CPA have moved the batteries from the 440 machine back to their original locations so all our machines have battery backup again. 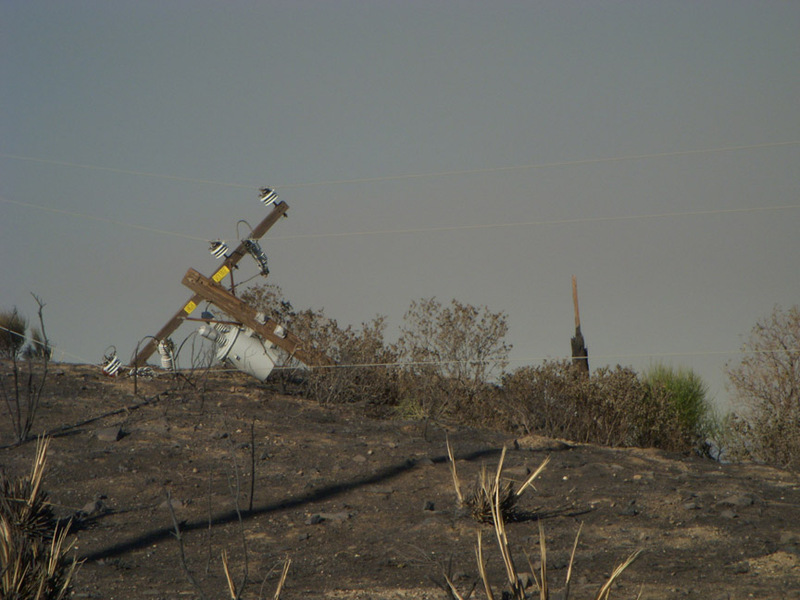 All of the connecting power poles from Veterans Park in Sylmar to the site were destroyed in the fire. There is no road access to these poles so they must be installed by helicopter. It appears that SCE is having issues with the Forest Service in replacing these poles. SCE drilled new holes for the poles and apparently the Forest Service will not let them install the poles in the new holes. They are insisting that SCE pull the burnt poles out of the ground and use the old holes to install the new poles. Since the pole line is not accessable to heavy equipment, SCE can not pull the old poles. There may be temporary interruptions in our AC power for refueling generators and when they eventually cut in the new power lines. All of our systems, with the exception of the internet gateway, should continue to function on battery backup unless the power interruption is longer than three or four days, which SCE does not expect. We will keep you informed about any new developments as they come up. 11.24.08: Leon KC6JAR and Ken W6CPA made a trip to Contractors Point to charge the batteries. The power is still out at the site and will be out for some time. SCE has begun replacing the power poles but they lost over 40 poles in the fire. Virtually every pole leading from Veterans Park (where the system ties into the grid) to the repeater site was destroyed. There are no roads to the poles and they will have to be installed by helicopter. Since the weather will likely not be suitable for helicopter operations for the next few days, SCE does not expect to restore the power for at least a week and possibly up to three weeks. Consequently, the 220 machine and the D-Star machines will likely not be functioning until the power is restored. We will continue to operate the 440 analog repeater and the link radio off of the combined batteries. We will keep you posted as we learn more. Leon KC6JAR and Ken W6CPA made a trip to Contractor's Point Monday afternoon 11/17 to assess fire damage. 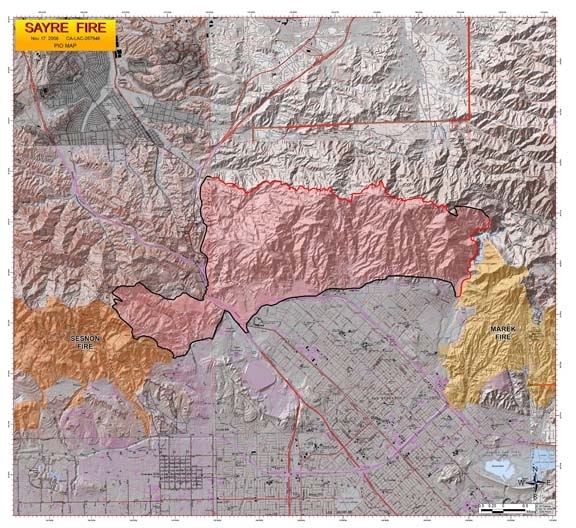 The Sayre Fire did go through the entire site; fortunately we suffered no damage. The firefighters did a great job and there was very little damage to any of the facilities there. Unfortunately the power is out and will be out for some time. One of the power poles burned entirely through and the wires were laying on the ground. SCE will not have access to the forest until Wednesday 11/19 and they need to do a survey first, so we will likely be without AC power for at least a week. Leon, Chris KF6RSF and Ken went up to Contractors Point again Tuesday night, 11/18, to get the analog repeater going again. The 440 analog machine and the link to Las Vegas are now operational. The fire burned several power poles, thus AC power is out. SCE expects it to be out for a week or so. To make do until SCE gets the power going again, we decided to take the batteries from the 220 machine and the D-Star machines, combine them and use them to power the 440 machine and link radio. As a consequence, the 220 and D-Star machines will be down until SCE fixes the power. We are reevaluating how we provide emergency power and have received several suggestions about how to make our emergency power more reliable. 70cm D-STAR from Blueridge, WB6IRC_B, is now on 446.880, which is the Test Pair. Follow this link for info on reprogramming your radio. At the recent SCRRBA meeting WA6IRC_B was given a home on 70cm: 447.040. Follow this link for info on reprogramming your radio. Our D-STAR system is back on the air after a brief time out Monday morning, 10/13, due to a large brush fire near the repeater site. We will be assessing damage as soon as the area is open again, but for now it looks like we are OK. 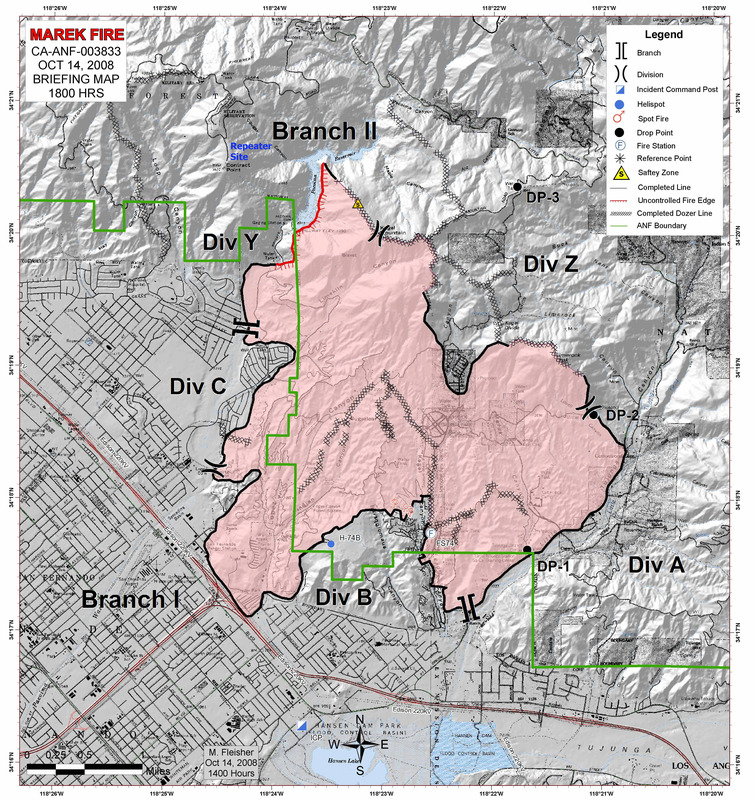 Here is a map of the fire perimeter as of 6pm Tuesday evening, 10/14/08. 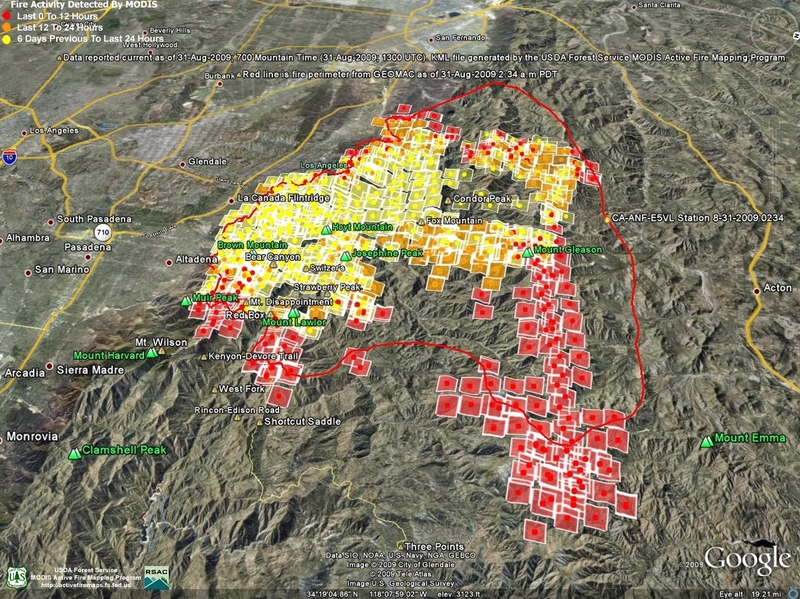 For more info on the Marek Fire see this link. ICOM released an update for the gateway software that addresses some of the data synchronization issues the D-STAR community has noticed. The big change is that switching between local modules results in an immediate local database update. And that means when you switch between 2 meters and 70cm during your commute, the gateway sends data to where you really are! Database updates among the 200+ gateways is supposed to be improved with this update. Initial testing seems to bear this out. Give it a try and see what you think! And if you thought that was a JA station you heard on the system, you were right! The Japanese D-STAR network is now connected to the worldwide D-STAR network. Advanced repeater linking and "One-Touch" capabilities are not currently available to JA stations, so contacts must be made with the JA call programmed as the URCALL, or as a gateway CQ call to the JA repeater, such as /JP1YIVB. Be sure to announce what repeater and module that you are on so the JA station can program accordingly. Remember that Tokyo is 9 hours ahead of UTC... give a call in the early morning and you may catch some JA stations before they go QRT for the night. Follow this link for a list of Japanese D-STAR repeaters. The WA6IRC G2 Gateway has been up and running for about a month now, and we have been testing mercilessly. One thing that has been noticed is gateway calls do not always go as planned, i.e. the remote stations don’t always hear us, and sometimes we don’t hear them. In talking with the ICOM engineers, we learned that this is occurring on other gateways as well, even the portable gateway system taken to the Dayton convention. The issue centers around the time it takes for database updates to propagate through the D-STAR network. Out of the Dayton experience, the Trust Server team made some adjustments, so we should be seeing better performance. When you change bands or gateways, it takes a few minutes for that info to get to the 150+ other gateways. ICOM tells us this should occur within about 5 minutes, but network issues and other factors can significantly increase this time. If your gateway call doesn’t goes as you expect, this may very well be why. ICOM and the Trust Server team are continuing to work on improvements, so we will keep you posted. If you have not done so already, go ahead and register on on the new G2 network. Details for registering can be found here. D-STAR is evolving and as part of that process we now have “G2”, a new version of the software that runs the gateway at the repeater site. G2 adds some gateway features, solves issues with the previous version, and makes using the gateway more user-friendly. In order to fix one of the major issues with the previous version of the gateway software, a new user database needs to be created. So the downside of G2 is that we as users need to re-register on the D-STAR system. The upside is registration is done on-line.The WA6IRC D-STAR Gateway moved to the new "G2" network on Saturday April 12, 2008. Details for registering on the new G2 network can be found here. After a BIG D-STAR network cleanup early this month, things are working better. We have Voice ID and announcements on the system now, so give a listen, try out the gateway and let us know what you think. Here is some info on programming your radio to use the gateway Check here for info on gateways around the world. We have conquered our internet connection challenges and are now testing the gateway! A BIG thanks to everyone in the Club and at ICOM Tech Support who has helped get us to this point. We are fortunate to have a lot of talented folks in the Club, folks willing to help out with their unique abilities. In the days and weeks to come we will be testing out the gateway and configuring funtions such as IDs, announcements, messages and the like. As we gain experiance we will share what we find here. In the meantime, enjoy the system. Here is some info on programming your radio to use the gateway Check here for info on gateways around the world. Over the Veteran's Day weekend, members of the IRC traveled to our Blueridge site above Wrightwood and installed 2 meter and 70cm D-STAR repeaters. The 2 new boxes, W6CPAR, are on 145.585-, W6CPAR_C and 446.870-, W6CPAR_B. Blueridge offers coverage to the high desert and east end of the San Gabriel Valley, as well as portions of Orange and San Bernardino Counties. Program in the new repeaters and give them a try. The long-range goal will be to set Blueridge up as a zone, but for now we are running them as stand-alone repeaters. 2M DV Frequency Change: WA6IRC_C now on 145.605-. Please set your RPT1 and RPT2 parameters accordingly. In February, TASMA gave us a 2 meter pair to try out. An analog machine in the San Gabriel Valley is also on the pair, so the past several months have been a period of test to see if our digital voice machine on Contractor's and the analog machine can "share the pair". As suspected, the two don't coexist well. During this time we have been in communication with the trustees of the San Gabriel Valley machine, as well as with TASMA, and the consensus has been that the 2 meter DV machine needs to move to a different pair. Ken & Leon traveled to the recent TASMA meeting, and D-STAR was on the agenda. Rather than just moving the IRC to a different pair, TASMA has decided to give D-STAR a home on the 2 meter band by reallocating some underutilized packet frequencies for D-STAR use. The IRC has been assigned 145.605-, so go ahead and reprogram your radios, try out the new pair, and let us know how it is working. TASMA has designated 4 pairs, so look for other D-STAR repeaters on 145.585-, 145.595-, 145.605-, and 145.615-. Spring has arrived, Dry DSL has evaporated, and the 23cm DV repeater has "issues". Other than that, all is well :-) After assuring us that they could bring us DSL, Verizon finaly confessed that our phone circuit at the site is fed via an old microwave link that doesn't support DSL. We are working on a different way to get internet acccess to our site, one that makes use of a known good DSL connection. The 23cm DV repeater has been shipped back to ICOM for repairs... again. We hope they get it right this time, or we may need to send Leon up to Washington. All is not lost as our provider said there is a way around the Evil Pair Gain. They are working on "Dry DSL" for us. Probably more appropriate for our arid climate anyway... won't have to water it as much :-) There are some other options we are looking into as well in case our Dry DSL evaporates, so stay tuned for details! 2/25/2007 Update: TASMA has granted us coordination on 145.200- for 2 meter digital voice. Just a taste down the dial from where we were, so try it out. 2/19/2007 Update: Welcome to DSL H-E-doubletoothpicks... a familiar road for many. Our install date came with no DSL. Long story short, it seems our provider was unsure if they really could provide DSL on the hill, so they cancelled our account. Probably thought no one here would notice... After explaining our situation in detail, they assured us that, yes, DSL is available, and so again, we wait for service. 2/10/2007 Update: Preliminary gateway installation work done... DSL install scheduled for the week of 2/12! 2/5/2007 Update: We received the repaired 23cm and 70cm modules and put them back on the hill. Let us know how they are performing. 2/1/2007 Update: ICOM tells us the 70cm and 23cm repeaters have ben repaired and shipped. Look for these repeaters to be back on the air soon. Thanks Eric and Mark for "encouraging" ICOM to work quickly! 1/28/2007 Update: 2 METER DV FREQUENCY CHANGE TO 145.270- Since the 70cm and 23cm DV repeaters are down while we wait for ICOM to ship replacement modules, we took the opportunity to enhance 2 meter DV operations. The previous frequency pair is occupied by an uncoordinated repeater, which, being tied to a linked system, is rather busy. We anticipate this change will offer improved DV service on 2 meters while we await final coordination from TASMA. Check it out and let us know. 1/24/2007 Update: Bad news from ICOM... they want the defective 23cm and 70cm modules returned BEFORE they will ship out replacement modules. We will travel to the hill this evening to remove the units and ship them back to ICOM in the morning. In the meantime, we will have the use of the 2 meter DV repeater, but due to co-channel interference, this repeater doesn't perform well outside of the San Fernando Valley. At this time it is unknown how long it will take ICOM to ship out replacement modules... In the meantime, take deep breaths, think peaceful thoughts (or not) and check back here and on the analog repeaters for updates. 1/20/2007 Update: Network link installation and testing in progress starting the 20th... Gateway soon! 1/9/2007 Update: The 23cm DV and DD modules are installed, but... after checking power output on the 70cm and 23cm DV modules, we found the units out of spec. No power on 23cm and 8.5 watts on 70cm. ICOM will be shipping replacement units... thanks Eric for expediting! Look for "Full Power" on 23cm and 70cm DV as soon as the units arrive. 1/3/2007: Back to the hill for antenna work.. and if all goes well, 23cm DV and DD! Check back to see how we faired. 12/30/2006 Update:We traveled to Contractor's and prepped the 40 foot wooden poles for antennas. This included clearing the existing antennas, or remnants to be precise, from the poles. Antenna mounts were installed for the D-STAR 2M, 70cm 23cm digital voice and 23cm digital data antennas. We were able to run most of the cable too before the sun set. Whew! A loooong day, but the hard work is done. We will travel back to the hill in January to finish the work. Oh, Ken & Ed have completed Gateway Certification too! 12/16/2006 Update: SCRRBA has granted test coordination for 23cm! Look to 1282.650- for digital voice, and 1299.700 (simplex) for digital data. Work was to be done today at the site, however the rain has kept us off the hill. Check back for the latest! Over the weekend of December 2-3, Leon, KC6JAR and Ken, W6CPA installed the 2 meter and 70cm D-STAR repeaters at Contractor's Point. We have now entered the "Testing Phase", so frequencies and configurations are likely to change as we receive coordinations from our area Frequency Coordinators. Current configuration for December 2006 is WA6IRC_B on 446.870- and WA6IRC_C on 147.210+. Please set your RPT1 and RPT2 parameters accordingly. During the next several weeks we will be working on improving sensitivity for both the 2M and 70cm repeaters. Remember, D-STAR frequencies and configuration may change, so please check back here for current info. Now that we have the 1.25M Blueridge analog repeater and link site back up and running, we can focus on D-STAR. Our plan for the month is to install the digital voice repeaters, antennas, etc. at the Contractor's site. We plan to put the 70cm digital voice repeater on the air first, with 23cm DV following shortly thereafter. Next will be 23cm DD and 2M DV. The D-STAR repeaters arrive! This is so exciting! Ham Radio Outlet Burbank moves to a new location and has an Open House. Great job by Mark, Steve, Eric & The Crew at HRO. As we enjoy the new digs, several of us get a chance to talk to the ICOM D-STAR rep.... and so begins the Independent Radio Club's Odyssey. Leon uses a ladder to enter the venue for our Holiday Party... he would have used the keys, but they were on the other side of the door. Could D-STAR have saved the day? Probably not, but we had to work the "Ladder Story" in here somehow. Chris Columbus muses, "Boy, sure wish I lived in the 21st Century... those D-STAR radios will be sooo cool!" Open Nets Tuesdays 8pm. All Are Welcome!